Tailwinds from Cyber Monday could tip the scales to help Amazon beat Wall Street's expectations for the fourth quarter. If this year's Cyber Monday sales are any indicator, Amazon.com Inc. (AMZN - Get Report) could be shaping up to have a very happy holiday. 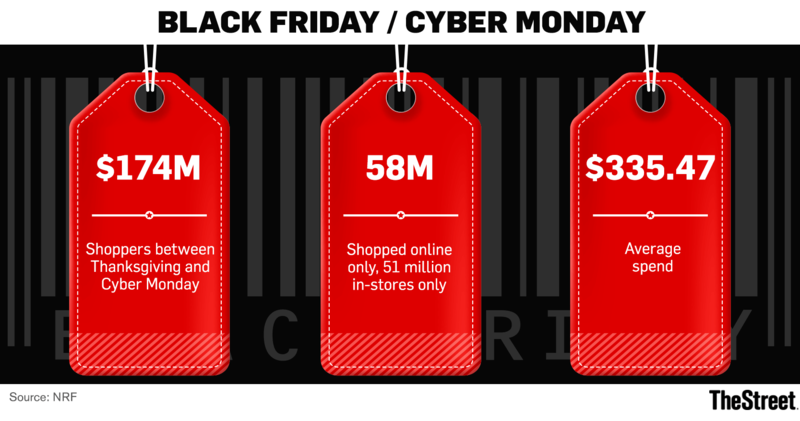 Consumers racked up $6.59 billion in purchases on Cyber Monday, marking a 16.8% increase in sales year-over-year and earning it the title of largest online sales day in history, according to data from Adobe Systems Inc. (ADBE - Get Report) . Amazon, which is estimated to have captured between 45% to 50% of all holiday online retail sales, is expected to grab a similar share of Cyber Monday shopping. "This growth is consistent with the strong trend we saw emerge on Black Friday and throughout the weekend as many consumers continue to transition from offline (brick and mortar) to online retail sales with Amazon being the clear star of the show," said GBH Insights analyst Daniel Ives. Amazon's vast Prime subscription network, which is estimated to be 85 million members, likely helped to create a "ring-fence" that helped it dominate in the "fiercely competitive" cyber Monday pricing environment, Ives added. The Cyber Monday tailwinds could give Amazon enough momentum to beat Wall Street's top line expectations for the fourth quarter by 5%, he noted. Wall Street projects that Amazon will report adjusted earnings of $1.89 per share on revenue of $59.5 billion during the fiscal fourth period. "While Walmart (WMT - Get Report) is emerging as Amazon's biggest sole competitor online, we believe customer overlap remains small today as Prime membership growth and Amazon's 'stronghold on e-commerce' remain hard to penetrate as we expect this trend to play out again the rest of this holiday season based on our checks," Ives explained. Amazon said on Tuesday that it sold millions of Amazon devices between Thanksgiving and Cyber Monday, making it the "best-ever" holiday shopping weekend for Amazon devices. The Echo Dot, Amazon Fire TV Stick and Alexa Voice Remote were the best-selling products from any manufacturer in any category across the entire Amazon.com website, the company said in a statement. Market watchers have come to expect blowout holiday sales periods for Amazon and have now turned their focus to the ways in which the period is used to covert shoppers further across the Amazon ecosystem. One big way that Amazon has done this is by encouraging users to place orders through their voice-controlled Echo devices by offering exclusive holiday discounts to voice shoppers. Kantar Retail analyst Robin Sherk said in a recent interview that voice-controlled shopping is still in its early days, but that it's beginning to catch on among many consumers. Among people that own an Alexa-enabled device, roughly 15% to 20% of them have used it to purchase things, she noted. "It's a minority, but a sizable minority," Sherk explained. "I think it's a bit too early to judge just how big its going to get."